Are you focused on growing your business - through fundraising, sales or partnerships, or looking for new, exciting tech to bring to your marketplace? Or maybe you are looking to invest in real tech that actually works? If you answered yes to any of these questions, join us for the Brinc Growth Night! On November 9th, Celeste Zeng from Global Sources and Caroline Hammet from Easyship will share best practices for growing your business through cross-border shipping and distribution platforms for hardware startups. The panel discussion will be followed by the THero Pitch competition, where 10 startups will pitch in front of the potential customers, investors, and the Chinese and Hong Kong government. 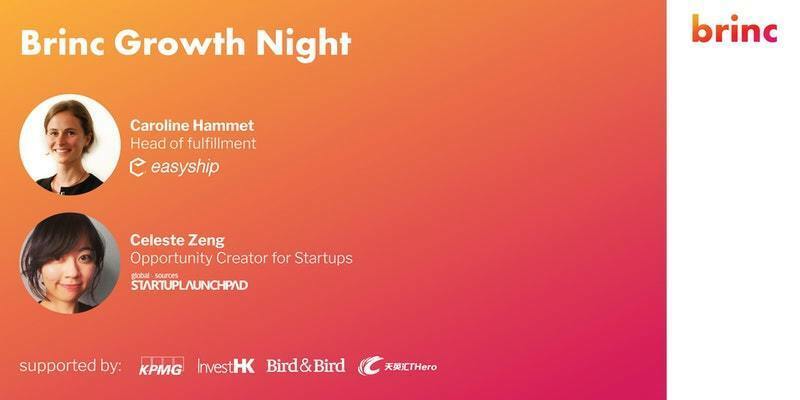 Join us at KPMG Hong Kong and connect with startups, investors, distributors and corporates! 5:45PM - Panel discussion with Celeste Zeng from Global Sources and Caroline Hammet from Easyship, moderated by Nick Ramil from Brinc. Celeste Zeng is currently the Greater China Partnership Lead of Startup Launchpad, a sub-business division of Global Sources (Blackstone Portfolio company). Celeste is responsible for leading initiatives to help build the Startup Launchpad brand and develop new and existing client relationships. She focuses on developing and introducing new approaches and opportunities to domestic startups to achieve global distribution and find manufacturing partners. Before joining the launchpad team, she was a founding member of the Global Sources’ cross-border O2O distribution channel named Global Sources Direct..
Caroline Hammet is in charge of the e-fulfillment business unit at Easyship, doing both sales and operations. Her team's goal is to build, grow and improve their warehousing solutions, to ensure a seamless shipping experience for the clients. Caroline is responsible for establishing new partnerships with warehouses worldwide and closing account management for specific logistics projects (bulk shipments). Prior to joining Easyship, Caroline worked as Partner Account Manager at HP, focusing in development of indirect sales. Nick Ramil is Head of Validation at Brinc. As a founding team member of Brinc, Nick helps startups who are creating great products secure the right visibility and distribution channels. Through crowdfunding he has raised multi-millions (USD) for multiple hardware projects and built successful businesses in various industries, from import/export coupled with distribution to product development. Prior to Brinc, Nick founded EnterChina, the #1 private online community for doing business with China.